It took me years to discover many of the techniques she spells out in her book. I wish it had been available when I started..
-Allan Gardyne, AssociatePrograms.com. . . 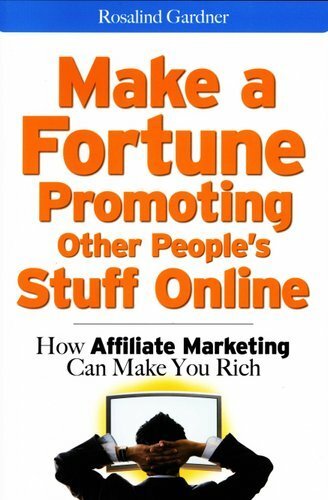 The definitive guide to planning and managing a successful online affiliate business!. . "Make a Fortune Promoting Other People's Stuff Online" is your hands-on guide to starting your own profitable affiliate marketing business quickly, easily, and inexpensively. Leading affiliate marketing authority Rosalind Gardner gives you a proven five-step plan for identifying a niche with a huge market, choosing products to promote, and selling the benefits effectively. You'll see how to: . . Navigate the different affiliate programs, from commissioned-based click-through programs to CPM impressions to flat-fee referral. Identify the products and programs that are profitable-and the ones to avoid. Ask the right questions before you join an affiliate program. Research, understand, and sell to your niche market. Negotiate for a higher percentage on your commission. Stay on top of developments in the industry. . Packed with time- and money-saving techniques-including twelve ways to drive traffic to your website at no cost-this comprehensive guide is all you need to make big profits as an affiliate marketer!. . 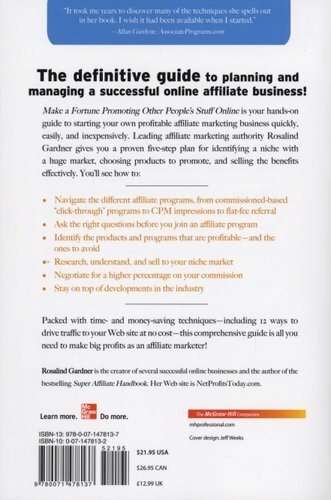 Rosalind Gardner is the creator of several successful online businesses and the author of the bestselling "Super Affiliate Handbook," Her website is NetProfitsToday.com.. . . . .